The town of Loveland arose on the northern Front Range along the Big Thompson River, although it is often mistakenly associated with the mountain pass and ski resort that share the same name. 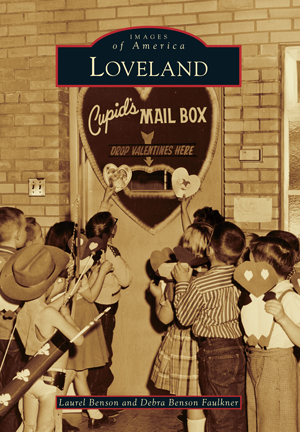 Located where the beauty of the mountains meets the bounty of the plains, Loveland became an agricultural and transportation hub when platted by the Colorado Central Railroad in 1877. The area boomed as the site of the Great Western Sugar Company's first factory in 1901. A natural gateway to the scenery and recreation of the Rockies, Loveland was also the headquarters for major water diversion projects. The romantic-sounding name inevitably led the "Sweetheart City" to promote its postmark in a Valentine re-mailing campaign that began in 1953. Since then, the community has evolved into a high-tech manufacturing center and public art showplace. Longtime residents and enthusiastic boosters, mother and daughter coauthors Laurel Benson and Debra Benson Faulkner delved into the extensive photographic archives of the Loveland Museum/Gallery to mine images that tell the town's life story. Along with illustrations supplied by local residents, these pictures chronicle the community's continual reinvention and the unique melding of myriad identities into a distinctive composite of past and present.